After a while, with some delay, I found also some time to write about Agilia Conference. Now, when did it all fall down away from me, I start realizing how big pile of work we did and how everything run smoothly toward the end. Let’s go back 2 weeks. I will share with you how I saw the whole event. It all started on Monday with a small heat up of 3 great workshops – The AgilePMO, Videoprototyping and How to approach internal start-ups? All of them we run for the first time and all were very well accepted. And then it all started on Tuesday morning. Same like years before, but in bigger scale. Crowds of people queuing in front of Avanti lining up toward registration sets expectations of great event. And, unlike previous years, and as event gains its reputation, along with Czech and Slovak also Polish, French, Italian, German, Bulgarian, Russian and many more languages can be heard. True Babylonia. Nine o’clock, and I have opened the Conference. This year we have returned to our original idea of 2011 to focus more on agile adoption in organizations. Because Agile is not about SW development, but about streamlining and improving your whole organization. Yes, I said that, and I stand that. It reflects selection of presentations and division of tracks. 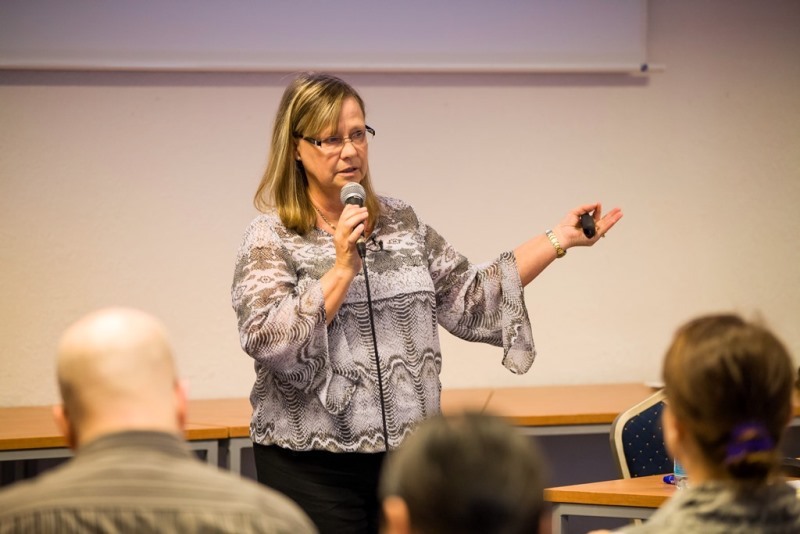 Agile Management Congress focus on management of organizations with topics including purpose of agility, implication for business, financial management, agile culture or vision. Originally it was meant as separate event, but we found it too complex to organize, while implications are important for many. Other two tracks focus on implementation aspects of agility, this year particularly agile testing, issues of software architecture, team collaboration or product management. A lot of learning possibilities. On the beginning there is chaos. It requires dedication and focus to go to the top. It is hard work to achieve success, and one also have to sacrifice something. Success is a team work. Remember, when you are down, how was it? Do not forget it. And do not afraid big problems, they will certainly come, but they can be sliced and solved. Technical knowledge is considered standard. (Almost) everyone has it. Emotional intelligence is that makes difference. People into the team should be chosen according to ability for team work, not according to technical skills or other preferences. Next keynote was by Bjarte Bogsnes, VP of Statoil and one of key members of Beyond Budgeting Round Table (BBRT), who presented us applicable agile techniques in management. Many developers may feel surprised, but Agile must penetrate the whole company to be sustainable. And it requires significant change of mindset, which is never easy. Interesting point was complain about common perception of corporation being seen as inflexible and rigid. Bjarte argued, that does not always be truth. Lunch as well as other food was prepared by our Chef, Mr. Radek Prihonsky, who was assisted by team of Avanti kitchen. Ferrari stylish. I believe everybody enjoyed. Because, tell me the truth, which conference has “Michelin” star chef? Radek cook representative menus for government and foreign state visits of Czech Republic. Pawel Pustelnik has presented story of building agile company culture in Future Processing (FP). He shared what they do and how, and occasionally with video insights, or having speak its customers. It was not problem to keep company culture in FP, while business was small. It is more challenging, when company started its fast growth and new people got onboard. In FP they do it via many things, including internal Olympic Games. To me, most appealing was talk of the customer, who presented his involvement into process of creating solution and how he has it enjoyed – true core value of Agile. I am constantly looking for examples of agile culture in the companies in Europe. I try to bring them to Agilia, let them share their experience and inspire others to follow. They are still not many in Europe, and it is hard to persuade them to come. Therefore I appreciate Pawel who came. I wish I could one day invite Czech or Slovak company, too. 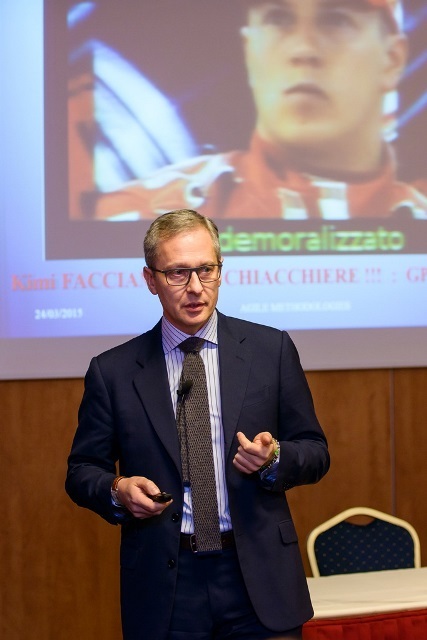 “How do you cannot be impassioned, when everything around is red!” Another surprise was Enrico Lombardo, former project manager for Ferrari. It was last minute arrangement. And his presentation was outstanding in another way – no slides, just pure storytelling. About his live in Ferrari from the moment he entered through the door throughout almost entire career. It was about overcoming obstacles and persuading to achievements. Starting with team of aerodynamics. Toward most resistant engine guys. Step by step, in a disciplined and systematic way. Because there are only 3 numbers in the end. 900 people, 18 races, and 2 people. And no KPIs, you just have to win. I was lucky to have dinner with Enrico. I learned, Ferrari is very attractive employer in Italy. There is pile of applicants on waiting lists and it is very valuable part of the CV for the future. In the same time, salaries are lower, than elsewhere. Remember, how much your company invest to attract talent? And finally, it is cool to know somebody, who can call Enzo Ferrari a colleague. There is also another thing I found interesting. After 3 years of beating of my head to the company’s wall, and after many refusals, I have got to the point, where I have had a choice. I received few CVs of prospects for speakers to choose from. All of them were working in the same time for a company. All of them were graduates of most prestigious universities or institutions in Europe one can imagine, or in the world, often more than one of them. I have never ever seen anything similar here. (Frankly, last time I saw something like this it was in ESA – European Space Agency branch in Noordwijk). Seeing from this perspective, I see management of Czech technology companies as underqualified. It may be reason why do we struggle with building truly successful Czech based global company. 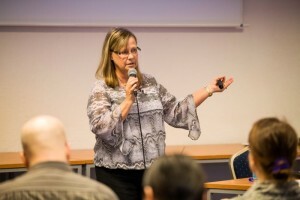 Day ended with Janet Gregory closing keynote – Key factors for Agile Testing Success, based on her currently two books – Agile Testing and More Agile Testing. And not everything. For those who remained at venue site, in the unofficial bonus track at the end of the day Viktor Nagy from Hungary set up small presentation about his journey in agile transition in small company. It resulted in very interesting discussion afterwards. There are companies, out there, which struggle with similar problems as we do. Day ended at Pavillon Restaurant. Good music, delicious food, finest Moravian wines and very good atmosphere – ideal environment for networking and discussions. Nice summary of the day by Jakub Szczepanik you can find here (in Polish). About author: Michal Vallo helps managers to understand agile techniques, benefit from its adoption to their organizations and consequently radically improve organizational overall performance. 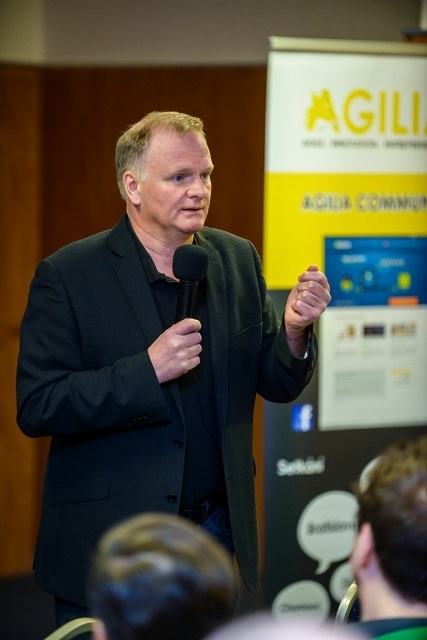 He is principal, agile trainer, coach and manager at Aguarra, founding member of Agilia community and organizer of Agilia Conference in Brno and Agilia Budapest Conference.